I love how some restaurants just put a bottle of water on the table and you can refill your own glass. 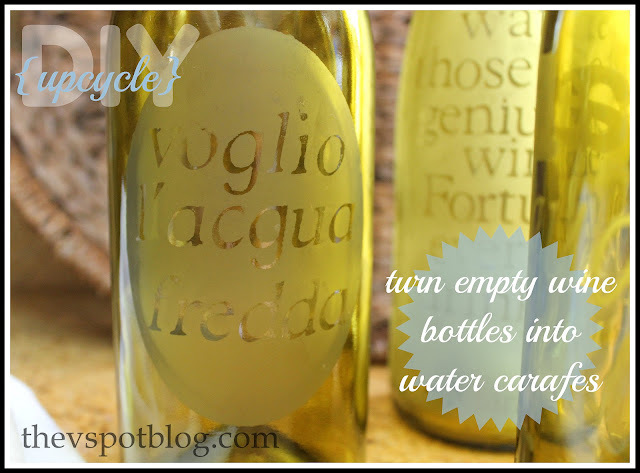 That concept and a plethora of empty wine bottles led to this: DIY etched glass water carafes. I’m hosting bunco this week and since you should always drink lots of water along with your wine, I thought cute water carafes would be just the thing! I figure I’ll just have them on or near the tables and my friends can just help themselves. 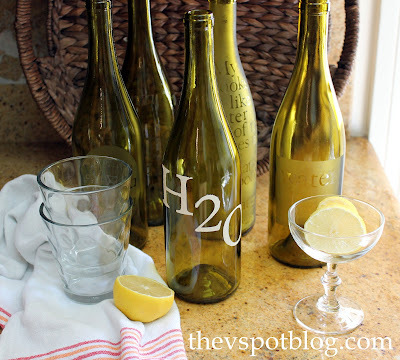 Gather your wine bottles and soak them in a bucket or pot to loosen the labels. Fill them about halfway with water so that they won’t float. The labels should peel right off. Scrub off any remaining glue or paper, rinse and dry. While the bottles are soaking, prepare your designs. I used my Cricut and contact paper, but you could use store bought adhesive labels too. My books are like water; those of the geniuses are wine. Fortunately everybody drinks water. I placed the letters using the ole Eyeball Technique, then taped of the top and very bottom of the bottle and liberally coated the entire thing with etching cream. (I like Armour Etch.) I don’t care that the instructions say that you’re good to go after 5 minutes… I let it sit for about 20 minutes to a half an hour, then I wash it off. I did a couple of different ones. I think they’re fun and when I’m done with bunco I will either toss them into the recycle bin, or I will let my friends take them home if they want them. 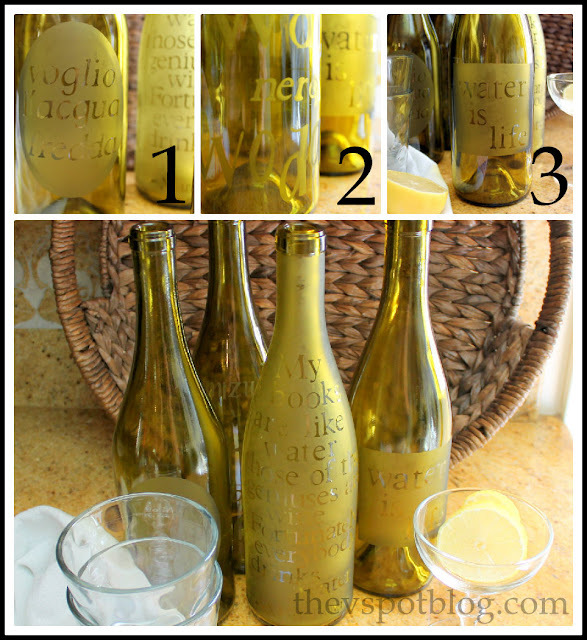 If you don’t want to etch them, you can also paint the bottles. Plaid Folk Art makes an enamel that is good for glass and it cures so you can wash the bottles too. They sent me some to try and I hadn’t had an opportunity until now. They are very easy to use! Clean the surface with rubbing alcohol and make sure you save the directions on the back of the packaging for future reference. I made a stencil, then used a Martha Stewart stencil brush to apply the paint, then smoothed over it with another brush. Let it dry for an hour, then put it in a cold oven and turn it up to 350 degrees. leave it in for 30 minutes, then turn it off and let it cool in the oven. While you can’t put it in contact with food, it’s cured enough to be hand washed or top rack dishwasher safe. I’ll be doing lots more projects with the enamel paint, I’m sure. To check out my other tutorials using glass etching cream, click HERE. Love this idea! They all turned out beautiful! This is a wonderful project Viv! Love it and pinning it! It’s like a reverse etch- never would have thought to do it this way. Oh and I just signed up for the so-cal social! 🙂 Hopefully it worked as I didn’t get my confo email yet. These look great, Viv! I love that quotation from Mark Twain. I need to write that one down and keep it in mind. Of course, he’s the source of one of my all-time favorites: “Better to remain silent and be thought a fool than to open one’s mouth and remove all doubt.” I should have that tattooed on my arm. Anyway, I like your water bottles! 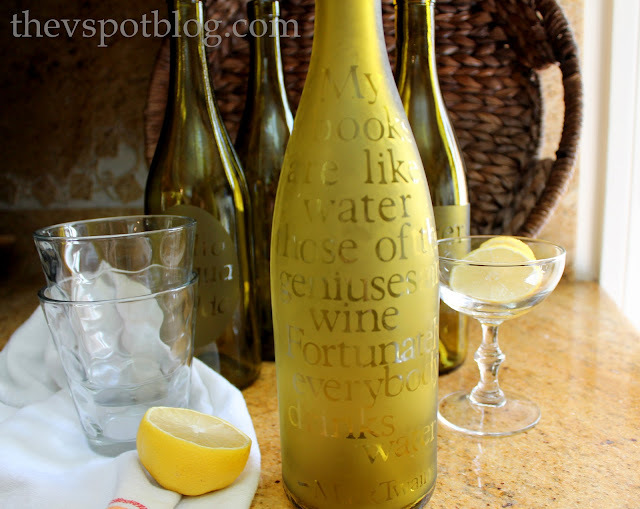 I need to look into glass etching–looks like fun! Pinning this. I’m always on the lookout for useful homemade gifts for Christmas, and this fits the bill. We have plenty of those empty wine bottles laying around, don’t we? 🙂 Cute idea! Viv, these are so beautiful! And definitely the perfect upcycling project. I SOOOOO love this idea! 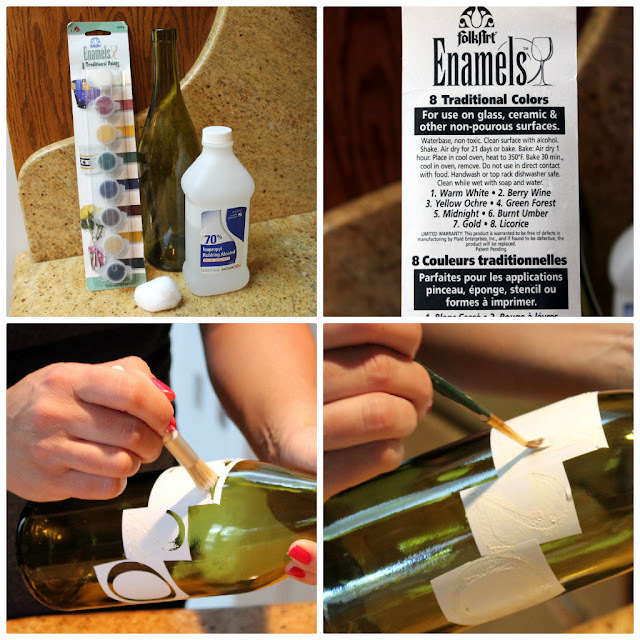 I have a couple bags of wine bottles left that I was doing mixed media on ….but I’m tired of that and I was just going to throw them away — now I have a new fun project to do with them! Thanks!!! I want to etch the window over my kitchen sink with a design of leaves and branches – to help obscure the view of the house next door. I contacted Armour Etch and asked if contact paper would work with Armour Etch for this project and they said they didn’t know??? but as I read your blog, as long as I press the contact paper down firmly I should be able to get clean edges like with the letters on your wine bottles… Right?… I want to cut out the Contact paper with an Xacto knife. What a great idea…I’m making these. Thanks for sharing.